Perhaps #7 Brigham Young had started to empower some doubters. If their three double game point losses to non-contenders over their past two tournaments had opened up the door for criticism, they slammed it in the face of the haters in winning Northwest Challenge. Most notably, they again handed Cal Poly SLO a 13-9 loss, a repeat of the count they beat SLOCORE by at Presidents’ Day Invite, in the de facto final. They were challenged by Washington, but ended the weekend as the top performing west coast team in the division. Teetering on the edge of holding a strength bid for the Southwest, going to Trouble in Vegas was a real roll of the dice for #14 Southern California. They needed runner-runner blowouts to hit the jackpot. But USC played their cards right, marching undefeated through the field with five effective Ws. Now all they can do is sit back and watch to see if any of the teams at Easterns, Huck Finn, and the like have a good enough hand to wrench away the Southwest’s chip stack. At College Southerns down in Statesboro, GA, the #1 Middlebury Pranksters confirmed their place at the top of the rankings with a dominant run to the finals that included a 13-8 win over #2 Carleton GoP. GoP had a strong weekend in their own right, making it to the semifinals and only losing to Middlebury and eventual champions South Carolina. #20 Luther LUFDA had a strong debut for their 2019 season, finishing with a 5-2 record and both losses on double game point. #23 UNC Asheville rounded out the notable teams in attendance with a solid 4-3 record and 10th place finish. CWRUL Memorial in Columbus, OH was disappointing for the division, with no team making it past prequarters, but several teams stepped up in consolation play to finish with strong weekends. 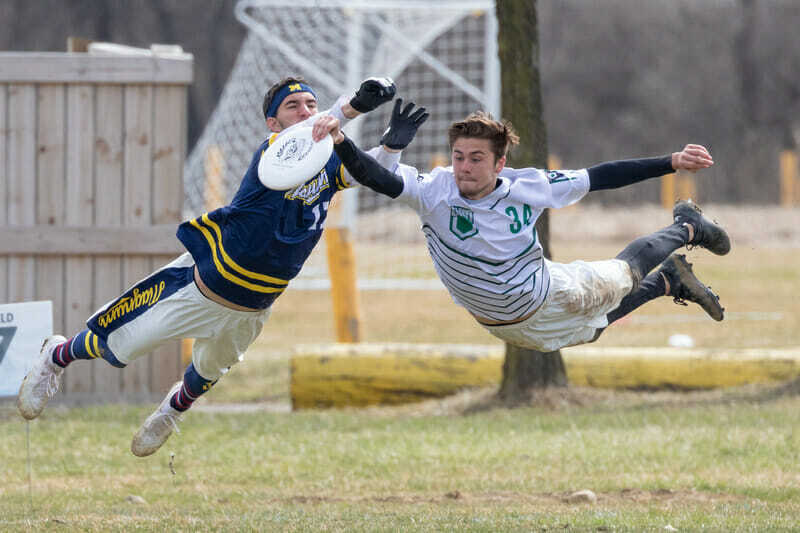 The Oberlin Flying Horsecows had the best weekend of D-III teams in attendance, going 6-2 and finishing 9th in a much-needed bounce back performance after two disappointing tournaments to start their season. Cedarville Swarm went 4-4 and finished 14th, while Xavier B.L.O.B. went 3-5 and finished 16th, including a double game point loss to Swarm. The Knox River Rats went 4-2, with their two losses coming by a combined three goals, and staked their flag as a contender for the lone Nationals bid to come out of the Great Lakes. After Saturday was cancelled due to inclement weather, #21 Haverford Big Donkey made their 2019 season debut by getting five match play games in at Hucktastic Spring. Big Donkey went 3-2 with easy wins over weak opposition and blowout losses to the stronger teams they faced, suggesting that they will be joining a crowded middle-class in the Ohio Valley. Magic City Invite in Birmingham, AL gave a sneak-peek at what we can expect from a sizable portion of Southeast Regionals. Playing with a small roster, North Georgia Summit fared the best, grinding out a 4-2 record and third place finish with just a +8 point differential. However, Summit’s most dominant win came 13-7 over D-III rival Samford Dogma, who had a middling 4-3 record on their way to a disappointing ninth place finish. The Berry Noble Savages rounded out the D-III teams in attendance, going 5-3 while unfortunately not matching up with either of the other D-III teams in attendance. At Meltdown in Loves Park, IL, a darkhorse in the South Central continued their winning ways, while the outlook for the Great Lakes only got more confusing. Truman State JuijiTSU improved their season record to 12-1 with a run to the championship game, where they lost to Marquette. Although Truman State’s record lacks any major noteworthy wins, JuijiTSU is building a habit out of winning, and in a South Central region that looks likely to have multiple strength bids, they’ll have a real chance at making a game-to-go. Winona State Experience had a strong showing for the North Central, going 5-3 en route to a fourth place finish. The Great Lakes teams in attendance proved difficult to distinguish from one another. Olivet Nazarene, North Park, Valparaiso, and Wheaton all picked up wins over each other while also suffering losses to D-III opposition. At Spring Awakening in Saratoga Springs, NY, impossibly difficult winds on Saturday made results difficult to read into, with comically low scores and wins being determined largely by the flip. On Sunday, #6 Bowdoin Stoned Clown emerged as champions, beating Army West Point 12-10 in the final. #5 Bryant Craze dominated at the round robin they hosted, going 4-0 with a point differential of +36. #25 Bates O-Whip went 4-0 at Mill City Throwdown, winning all four games by six or more goals. At Trouble in Vegas, Colorado School of Mines Entropy continued their season-long trend of struggling to break through with a signature win. A 10-9 win over Utah is their best of the season, but that was negated by a disappointing loss to Utah State. Still, Entropy has shown to be competitive in almost every game they’ve played, and they’ll be in the mix on Sunday in the competitive South Central. South Carolina continued what has been a very successful season by going undefeated at College Southerns. Their closest match was the final against Middlebury, which they won by a comfortable 15-11 count. No. 1 seed Villanova took control at Hucktastic Spring, fending off no. 3 seed Delaware in the final, 9-7, of the one day event. At Magic City Invite, Jacksonville State survived some close ones to take the title. They won a pair of one goal games on their way to defeating Mississippi State in the final, 13-10. It was a wire to wire win for SUNY-Oneonta at Towson Cup, where they worked over mostly B teams. They never gave up more than five goals. Butler went 2-0 at the one day series that was Indy Invite College. No. 1 seed TCU matched up with no. 2 Lamar in the final of Greatest Crusade. It was TCU who earned the undefeated win, 13-7. Bryant hosted Bryant Round Robin, Bryant won Bryant Round Robin. Makes a lot of sense. At Meltdown, no. 1 seed Marquette held seed by winning the tournament. They slid by Grand Valley State 13-11 in semis and capped it off with a 13-9 win over Truman State in the final. The top three seeds made the semifinals of CWRUL Memorial, along with host team Case Western. No. 1 seed Indiana conquered the field, beating Ohio in the final by a sizable 15-8 score. Bates went undefeated at the round robin Mill City Throwdown. The Mightiest Huck, hosted by Yale, went to the home side, who went undefeated to protect their New Haven turf, and hopefully didn’t celebrate with Modern, which is overrated. Things got a bit crazy in the quarterfinal round of Centex, where the tournament’s top four seeds were all sent into consolation bracket by a group of upstarts. While Utah was the event’s biggest surprise, it was Northeastern and Minnesota that met in the final. Rookie Clara Stewart had a standout performance in the championship match to lead the Valkyries their first tournament win of the season, 14-13. Both teams likely secured bids for their respective regions. For more on Women’s Centex, check out our tournament recap. In the penultimate weekend of the regular season, more teams were in action than nearly any other weekend thus far. Several teams made their 2019 debut, while others solidified their standings and resumes in the hunt for a bid to Nationals. At College Southerns, Carleton Eclipse went 2-1 in pool play, including an 8-5 win over North Georgia Aurea. Middlebury Pranksters got their first sanctioned play, starting out strong in pool play with a 3-0 record, including beating Luther Freya 13-2. Georgia College Lynx Rufus matched Eclipse with after finishing pool play 2-1. All D-III teams fell in the quarterfinals of the championship bracket, yet Middlebury took fifth place after a tight 10-9 win over Eclipse. Along the way, the Pranksters defeated Georgia College, who finished seventh; ninth went to North Georgia. At Meltdown, Truman State TSUnami dominated, winning all seven games to take the crown and never allowing a team to score more than five points in a match. Their results included direct wins over Winona State Bad Monaz twice, Valparaiso Chicks Hucking Discs, and North Park Allihopa. Bad Monaz only lost to Truman State on the weekend, notched a win over St. Benedict Rapture, and took second overall. North Park and St. Benedict had similarly productive weekends, each winning one game against the other, with North Park taking the third place game and Rapture ending fourth. Olivet Nazarene Black Penguins ended the weekend with four wins, and Valparaiso with two wins by the end of the tournament. On the east coast at Jersey Devil, the Ohio Valley, Metro East, and New England regions clashed with several games seeing sanctioned play for the first time all season. Notable results include Wellesley Whiptails taking second place overall, and Skidmore Wombats taking third after a 5-2 weekend that included wins over Lehigh and Amherst. Lehigh Gravity and Amherst Sparkle Motion struggled; both teams ended the tournament at 3-4 with losses to Skidmore of 8-7 and 9-5, respectively. Bates Cold Front continued their dominance with a 7-0 weekend, extending their undefeated 2019 season. Their closest matches came against Brandeis Banshee in pool play and RPI Strut in the final, where each opponent was held to six points. RPI had a similarly strong showing at Live Free and Sky, allowing teams to only score 6 points as well, until they fell to Bates in the final. Brandeis, Bowdoin Chaos Theory, and Bentley WoBUS had more mixed results, with records of three wins and a fourth place finish, five wins and a fifth place finish, and two wins for a eighth place finish, respectively. WPI went 0-4 in pool play, but pulled out a win in their final match of the weekend. Other tournaments also hosted D-III play around the country. In Ohio at CWRUL Memorial, Knox Alley Cats beat Xavier Ignition 11-8; Wheaton Mastadonnas similarly defeated Ignition 11-5. At Centex, St. Olaf Vortex took 21st with a 6-2 record, Trinity Altitude took 25th with a 5-2 record, and Rice took 31st with a 4-3 record. Trouble in Vegas Occidental WAC and Colorado School of Mines Enthalpy took third and sixth out in the west. #21 West Chester’s shot at a third bid for the Ohio Valley, and their top 25 spot, vanished at Jersey Devil in a 10-4 loss to Ottawa. The upset victory for Ottawa vaulted them from that success to go on to win the tournament after going 1-3 in pool play to start their season. An undefeated run through College Southerns wasn’t enough to get #22 UNC Wilmington back into the bid-earning range, hampered by a one goal win over Middlebury. They hammered Emory 15-1 in the final to end the weekend on a high note. Swarthmore and Haverford split their games at Hucktastic Spring, but Haverford took the final. You can read more about it about in our D-III section. Alabama defeated four of the five other teams at T-Town Throwdown to win their home tournament. They’ll carry a 15-9 record, mostly against in-region teams, into the Southeast postseason. D-III #1 Bates remains undefeated this season after cruising through Live Free and Sky. More on that in our D-III section above. Truman State torched the Meltdown field, conceding five goals or less in all of their wins. They’re undefeated in played games this year and have won both tournaments they’ve attended. Neither of the CWRUL Memorial finalists went undefeated on Saturday, so the respective Sunday performances of Penn State and Carnegie Mellon came as somewhat surprising. PSU earned the tourney title with a 12-9 win in the final. We’ve done it: the end of the regular season. Of course, in the final weekend, we’ve got capstone majors and a ton of events around the country as teams try to get in their final reps before the series. Hope you’ve enjoyed the ride. The women’s division headliner is Northwest Challenge (W1). Dartmouth, Carleton, North Carolina, Ohio State, and more travel to the west coast for a battle over the top seed at Nationals and, down the seedings, precious strength bids. Easterns (M) is the final gasp of the elite men’s season, with much of the east coast’s top teams in the field. Aside from trying to earn a top four Nationals seed, many of the teams in the middle of the seedings and below are fighting for their final shot at a bid for their region. Typically, Huck Finn (M) is the real battleground for bids. But this year, it looks less pivotal on that front, but both Central Florida and Ohio State are strong teams to headline the event. Comments on "College Update: Women’s Centex, men’s Northwest Challenge"